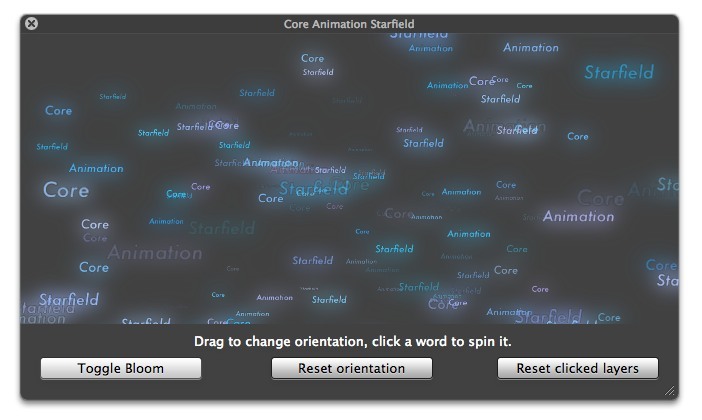 Here's a little Core Animation sample with 3d layers. After learning that core animation doesn't like a root layer with a perspective transform, this sample sets up the perspective transform on a container layer, and stores the CATextLayer layers there. Works pretty well this time ! This uses preferredFrameSize to set the CATextLayer bounds, animates zPosition with CABasicAnimation and opacity with CAKeyframeAnimation to get a smooth transition from invisible, visible, invisible. As we're going 3d, we don't work with (x,y) beetween ([0…frame width], [0 … frame height]) but with centered coordinates : [-width…width, -height…height]. This means our container layer needs to be centered in the view, or the 3d objects will appear to spring from the bottom left corner. hit testing a layer doesn't work reliably. the main layer is manually centered. Couldn't wrap my head around constraints. Core Animation culling problems Don't setup a projection transform on the root layer ! Runs like a dog on Macbook (1st gen) until you turn bloom filter off. Then runs really smoothly. Very nice example ! Thanks a lot. Apple should provide that as sample code for CATextLayer.